Lenovo Z5 Pro GT goes on sale in China - Playfuldroid! 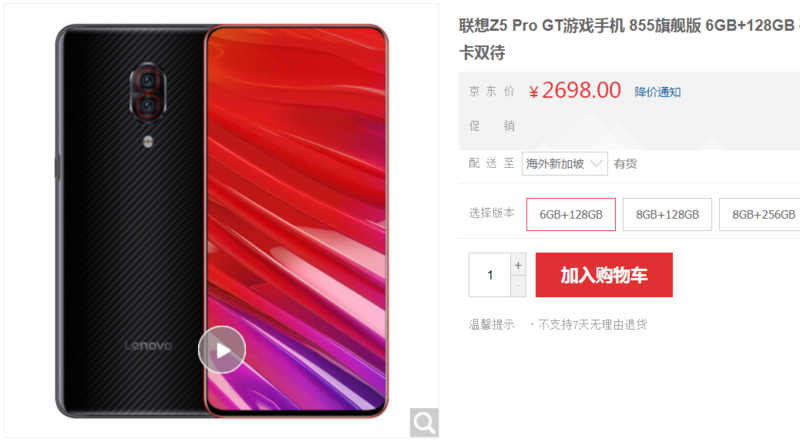 The Lenovo Z5 Pro GT which was announced back in December last year has finally go on sale in the Chinese market starting today. The device is the first smartphone in the world to pack the latest high-end Snapdragon 855 SoC – ahead of other big names including Samsung. Aside from that, the Lenovo Z5 Pro GT also comes with an incredible 12GB RAM under the hood, making it a perfect entertainment gadget on the go. For those who’re interested, the device will be coming in three different flavors. The entry-level model with 6GB+128GB memory configuration will come with a price tag of 2,698 Yuan (US$402), while the 8GB+128GB model will cost 2,998 Yuan (US$446). The highest-end model on the other hand, will be tagged with a competitive price of just 3,398 Yuan (US$506).